Go and give your support for this man. I fully agree with what he has to offer and in recent events how he wasn’t even invited to recent debates, yet wins the debate polls afterwards is unheard of. His message of revolutionizing the state of America is refreshing. Again, I respect John Edwards as well, but have nothing but the upmost respect for Ron Paul. ***Yes, you will see me get a little into this politcal stuff. There is so much going on and I feel this is important and I don’t want a Bush/Clinton dynasty in the white house. That is bizarre that you can both like Edwards and Paul, as they are ideologically opposite. Edwards advocates the utilization of governmental coercion as a means to accomplish a societal change (ie, using the heavy hand of government to do good). Whereas Rep. Ron Paul rightly recognizes that any government that is embolden to use coercion and violent means to achieve its ends will be embolden to use coercion to achieve any ends. And that such coercion only leads to one thing: the destruction of civil liberties. You americans get so caught up in politics. In australia you just vote for the person you think lies the least. No one really gives a damn. Thank you for having an opinion, and thank you for doing something about it. You’ve already done more than the vast majority of Americans today. I don’t know anything about Ron Edwards, or Ron Paul, I have been Republican bent since I started voting (for Reagan’s second term) Granted, we all have faults, but historically, fiscally conservative leaders have been, at least as a matter of voice, proponents of smaller government and lower taxes, concepts that have direct benefit on all classes—upper, lower, and middle. Socialized medicine, while a great concept, is a financial and governmental nightmare. I lived in Europe for three years, and saw 54% self-employment tax to cover all of the social “benefits”. Bigger and bigger corporations are not the answer either. While I do not want to enact limitations on earnings, something should be done. Robin-hood style take-from-the-rich-give-to-the-poor almost never works, it enables the already non-working and strengthens an “entitlement-expecting” lower-class. Example, post-Katrina New Orleans. Those making the most money in society are the ones fueling growth, and taking the most risks. Take a look at “Atlas Shrugs” sometime. While I disagree with the purely humanistic diatribe, the theme of the book has merit. Tax those that are creating the jobs, to the point of extinction, and you create chaos under the guise of “helping the less fortunate”. I, being republican bent, have been watching Mr. Huckabee. My first considerations for choosing a leader are finding a candidate whose moral underpinning is closest to mine. He also appears comfortable in front of people and cameras, and has experience in decision-making. We’ll see how it all pans out, and I promise to take a look at Mr. Edwards and Mr. Paul. Well, I’ve spoken enough for now. I appreciate your use of the word “sincerely.” I believe you are sincere; you have thought carefully about your choices and have taken action based on that reflection. Not glib, not off-the-cuff, but sincerely. Thank you. I have family in Cocoa, so I am in central Florida from time-to-time. I may look you up one of these days and take up your offer of a cup of coffee and good conversation. Maybe even about illustration and design! ps, yeah I know this is a copy of a reply to your post on the 7th, I was reading that days blogging when I decided to write!! I like the fact that you took the time to do a little research about who Ron Paul is and what he stands for. IF most people would turn off the main stream media TV and do a little research like you did, I believe there would be an upset in the elections. Even if Ron Paul doesn’t win, his ideas about spending, the war and the constitution are spreading like wildfire across the nation and that is what matters most. Its been proven time and time again that the middle class does financially better with a Democratic Government. I don’t know about you – but I was doing better during the Clinton years. Oh- and is John not Ron Edwards.. I was just wondering.. what font you used as a base for the “for president” script? Do you usually tweak a font out or do you typically draw your own script? would you consider doing a typography / type treatment tutorial? or know of any good artists to look at? Sorry about the typo Troy, I’ll be sure to check into John Paul for President. Thanks! …and by the way, we always use our moral beliefs in making a decision. You believe, morally, that gay rights, abortion, and stem cell research/usage are morally okay, and you express an opinion and decision based on that belief. Faith, when attached to moral guidance can also be interpreted “conscience”. To be completely, objectively divorced from ones own opinions is important when determining matters of justice, but when expressing ones opinion or choice, we always are affected by our own perspective/conscience/faith. careful josh, ron has some great ideas and stuff, but he also has some slightly scary ideas. i’m all for bucking the american status quo, however it’s got to be done carefully and logically. ron is on some pretty nutty stuff if you look a bit deeper. i’m not american so i won’t be voting, but…2cents for what it’s worth. Here are a couple videos that will get you thinking. I’m not saying they are 100% true but they will get you thinking. These videos are on all sides of spectrum. Anti-war, Anti-Religion, Religious, Truth-seeking, etc. I say watch them all, take them all in, don’t believe everything they say and formulate your own opinion. Don’t listen to everything your friends, family or paster has to say. Most importantly think for YOURSELF. I’m not a conspiracy theory kind of guy but there is a lot of power and money on the line in these elections and it does seem logical that people may go to great lengths to protect those interests and control. This is an HBO Documentary on the flaws and potential manipulation of our election processes. It will probably not surprise you – even if you have not already watched it. http://www.youtube.com/watch?v=YLVhAD77SVc&feature=related << Part 2 Starting to nail it here. http://www.youtube.com/watch?v=HTaCbH6zXU0&feature=related << Part 3 Muslims and Christians have what in common? http://www.youtube.com/watch?v=JiQD_g27X7g&feature=related<&lt; Part 5 Russia is about to get some! http://www.youtube.com/watch?v=Cy5cSNI8suA&feature=related << Part 7 of 7 Jimmy Carter was the worse? i am a democrat at heart, but RON PAUL is my Hero. i’ve waiting for the public to open their eyes and see that it is time to separate church and state. Mr. Paul is a money savvy guy, he seems to make sense, which for some reason the media does not like! You rock, man! 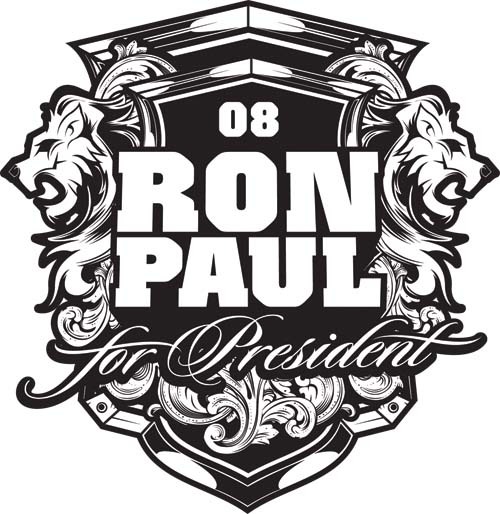 I’m a big Ron Paul supporter, so it’ll be fun to use this graphic. I’ll definitely give you credit where ever I use it. I met you a few years ago at the Relevant office for their open house. Glad to see you work continues to grow and remain… relevant. Now that Edwards has dropped out, I’m curious to who you will vote for? A good reason to vote for Ron Paul. NAU is coming, its just a matter of time.